This daring British wildlife photographer is shown taking a dip with a herd of wild elephants, who are crossing a river delta in Zimbabwe. 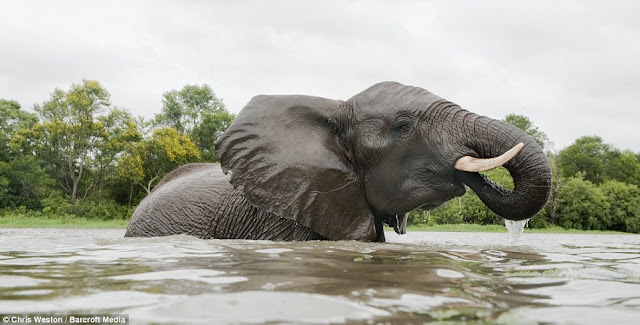 Using a floatation device hidden under his clothes, Chris Weston followed the herd into the tributary of the Zambezi River, capturing images that most wildlife photographers can only dream of. However, the 44-year-old from Weymouth had spent five weeks gaining the trust of the herd during his time in the Ngamo Game Reserve - which meant he was not considered a threat. 'I was never really in any danger,' explained Mr Weston. 'Although there is always an element of that when working with animals, especially ones this size. The seasoned wildlife photographer, who has travelled all over the world to document large mammals, says he wants to capture the personality of an animal in the same way a portrait artist would with a human subject. 'It's not so much getting as close as possible,' said Mr Weston. 'Lenses change the perspective of the way we see things. 'What I like to do is show it as we see it and the standard lens is 50mm which means you have to get relatively close. 'The idea is to give the viewer an idea of the personality of that individual animal. 'In much the same way as you would take a person's portrait, you can't be standing half a mile away with a long lens. 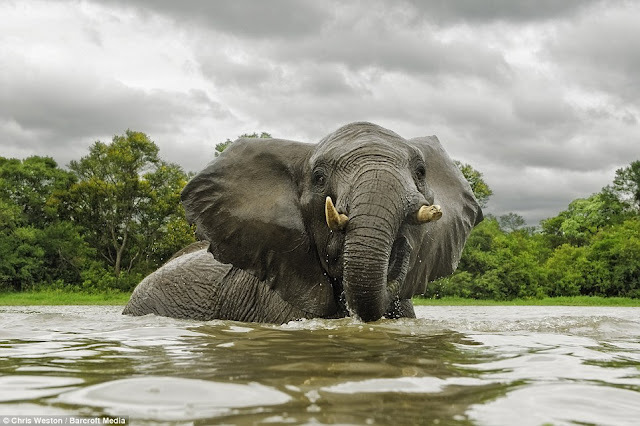 Mr Weston, who has been a professional photographer for 11 years, said he spends a long time building a relationship with his subjects and has returned to shoot the herd five times over the course of around four years. 'Elephants do have good memories,' he said. 'You can tell they remember you because of how they react when they see you. 'Each time I went back I could pretty much start again where I left off the last time. 'Many animals, such as lions, are wary of humans but elephants don't consider us a threat because of their size. 'I also think they have a better capacity to understand and reason than a lion does. Mr Weston used a vehicle to follow the herd but took to the water to get the pictures he needed. He said: 'They came out of the forest and began crossing the river. 'I was wearing a flotation device under my clothes and was able to get very close to them.